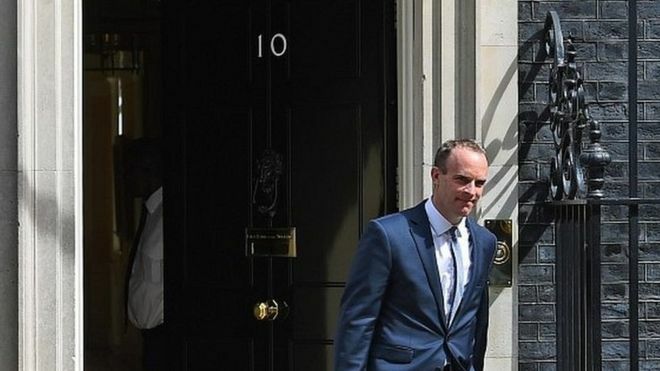 Dominic Raab has been appointed Brexit secretary by Theresa May after David Davis resigned from the government. Mr Raab, who is currently housing minister, was a prominent Leave campaigner during the 2016 referendum. Mr Davis quit late on Sunday night, saying Theresa May had “given away too much too easily”. The 44-year old Mr Raab, a lawyer before becoming an MP in 2010, will now take over day-to-day negotiations with the EU’s Michel Barnier. Mrs May’s Conservative Party only has a majority in Parliament with the support in key votes of the 10 MPs from Northern Ireland’s Democratic Unionist Party, so any split raises questions about whether her plan could survive a Commons vote – and has also led to renewed questions about whether she will face a challenge to her position. Mr Raab has served in government since after the 2015 election, initially working in the Ministry of Justice before moving to the communities department in January. The European Commission has declined to comment on the change of personnel, saying it would continue to negotiate with “good will” to try and secure an agreement on the terms of the UK’s exit and future relations. Asked how much of a problem Mr Davis’s resignation was for the future of the negotiations, a spokesman replied: “It is not for us, we are here to work”. Mr Davis said he could not remain in his post because he no longer believed in the plan for the UK’s future relations with the EU which was backed by the cabinet on Friday. He said he hoped his resignation would make it easier for the UK to resist EU attempts to extract further concessions – but he insisted he was not seeking to undermine or challenge the prime minister. In an interview with the BBC’s political editor Laura Kuenssberg, Mr Davis said Mr Raab would be “very effective” in the post. Reflecting on his resignation, he said he had lived with compromises in Brexit policy for two years but there came a point where these went “too far”. “I worry about the fine detail and that it will not work out as we hope,” he said. Asked what he would say to colleagues who thought it was time to remove Theresa May, he replied it was “not a good idea” – insisting that she was a “good prime minister”. The atmosphere is volatile. The long-standing Leave supporters of the European Research Group of Tory MPs will have two meetings today – either side of the PM’s address to her own MPs – to discuss next steps. Views differ on whether the government’s position is simply impractical – “the worst of both worlds” – or whether it actually breaches a manifesto commitment by offering a customs union in all but name. But there is agreement amongst many Brexiteers that the policy should change, and quickly. It is less clear how they will bring that about. If there is not a direct triggering of a leadership contest, what are the options? One is that Brexiteers go “on strike” and refuse to back government policy in parliament, weakening her premiership unless she changes course. Another is that backbench Brexiteers put more pressure on like-minded cabinet colleagues to follow David Davis out the door. Speaking to the BBC last week, Mr Raab said the process of negotiating Brexit was “rocky” but what mattered was getting there in the end, which would require “flexibility and pragmatism”. He told the Political Thinking podcast that he was “relaxed” about the UK leaving without a deal and it was “not something I would fear”. Conservative MPs welcomed the appointment of Mr Raab, who has a black belt in karate, one describing him as a “highly capable” figure with a clear attention to detail. But Labour said a new man fronting the negotiations “changed nothing”. “The deep division at the heart of the Conservative Party has broken out in public and plunged this government into crisis,” said shadow Brexit secretary Sir Keir Starmer. Asked whether Mr Raab would be in charge of the talks, No 10 said Mrs May had “always been, from the outset, the lead negotiator”. But a spokesman said there was a “huge body of work to be done, in terms of preparations for the UK leaving the EU and that obviously includes no-deal preparations as well”. Mrs May will address Parliament later on the plan agreed at Chequers on Friday as well as address Tory MPs as she seeks to keep her Brexit strategy on track. Ahead of Monday’s statement, opposition MPs and peers – as well as Tory MPs – are being offered briefings by Downing Street on the detail of the Chequers statement. A spokesman for the European Research Group of eurosceptic Tory MPs told the BBC that involving opposition MPs had caused considerable anger and was the government’s “stupidest mistake”. And Jacob Rees-Mogg, who chairs the group, likened a PM relying on opposition MPs to the children’s story in which the gingerbread man accepts the offer of a ride across a river from a fox, only to get eaten by it. Junior Brexit minister Steve Baker also resigned overnight. He told the BBC’s Daily Politics that he had been “blindsided” by the Brexit proposal agreed at Chequers and that he and his team had been preparing a white paper “which did not accord with what has been put to the cabinet at Chequers”.